Well this blog is pure serendipity. I was doing something else when I discovered this sitting quietly in Dynamics (not sure when it came in) and then I explored it. What I am talking about here. If you open a Unified APP, when you click on the small gear icon on the top right of your command bar, you would see an option – “Toast Notification Display Time”. What is this exactly? If you read the whole word together, it may sound gibberish but it’s actually quite familiar if you in web designing and you know the term – “Toast Notification”. 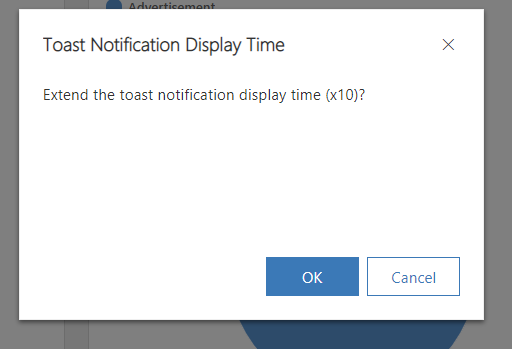 So let’s break it – It is “Toast Notification” + “Display time”. So what is toast notification. In UI (or I would say UX) world, toast notification is a small message that shows up in a box at the bottom of the screen (position may vary) and disappears on its own after few seconds. It is a simple feedback about an operation in which current activity remains visible and interactive. If you carefully read the definition above and specially the one I have highlighted in bold, it is a notification or action message which is visible on the screen for few seconds only. But how much are these “few seconds”? And that is where this setting comes into the picture. If you click on that option, you would get the below screen. Once you click “OK” on the above screen, you actually increase the notification timeout to 10 times its default. So now I hope you understand what is this setting all about. But where in CRM where I can test this. Sometime the most obvious things that we see every day are difficult to re-collect when required. We all have used the Quick create feature. When we create a record using Quick create, we get a notification “Your changes were saved” and also gives us an option to view the record. Normally this notification would remain on the screen for around 8~10 seconds. However when this setting is enabled, this notification would last on the screen 10 times of the default time. We understood the what and how part. But how can I leave my blog readers leave without understanding the “WHY” part. This feature has been introduced by Microsoft to facilitate users with cognitive disabilities or users who take more time to comprehend and react to UI elements than average users. P.S – This feature is only available in Unified interface. Enabling this has no effect on the Classic Web UI.